Sumiyoshi Taisya (住吉大社) is the grand shrine located in Osaka. It is the top of the all Sumiyoshi Shrines in Japan. The foundation of this shrine appears in Japanese Myth, Nihonsyoki. When the Empress Jingu attacked Korean Peninsula, she prayed to the god. Then, the gods of Shumiyoshi calmed the sea for her army to travel over the sea. After that, people established this shrine at this location. Because of the victory and safe sea traveling, Sumiyoshi Daisya has been highly respected by many people including Samurai. Sumiyoshi shrine enshrines the 4 gods of ocean. 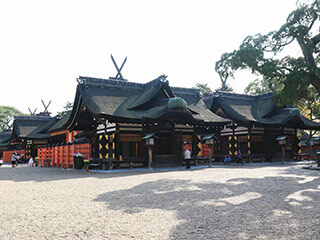 Therefore, there are 4 main shrines that registered as the national treasures. It is one of the most popular new year worshipping shrines in Osaka. Over 2 million people worship in the beginning of the year. 1. use JR Kanjo Line to Shinimamiya Station. 2. use Nankai Line to Sumiyoshi taisya. Sumiyoshi Grand Taisya is the top of all 2,300 Sumiyoshi Shrines in Japan. The history of Sumiyoshi Taisya appears in Japanese Myth, Nihonshoki and Kojiki. The Empress Jingu prayed her victory of the invasion at this shrine. After that, the gods of Sumiyoshi Shrine gave her army safe traveling over the sea and she won the battle because of their holy help. After the victory, she came back this place and established Sumiyoshi Grand Shrine here. The Legend said it was over 1800 years ago. Her grandson, the Emperor Nintoku removed the imperial capital to Osaka. Sumiyoshi Grand Shrine helped the development of Osaka as well. The gods of Sumiyoshi Grand Shrine is known as the god of Misogi, cleansing the soul and body. Also, because of the story of the Empress Gingu, it is also highly respected as the gods of the safe sea traveling. Minamoto no Mitsunaka, the lord of Samurai of Seiwa Genji clan, who built his Samurai army at Osaka, worshiped here, and settled his homeland at this place. Their Samurai clan became the origin of Seiwa Genji clan. His descendant, Minamoto no Yoritomo opened Kamakura Government that is the first government established by Samurai. Since then, many imperial families, Samurai, Daimyo and Shogun highly respected this shrine and donated many buildings and money. They are all constructed in 1810 and registered as the National Treasure of Japan. The unique architecture is called Sumiyoshi Style. The worshipping buildings are also registered as the important cultural assets. Built by Toyotomi Hideyori in early 17th century. Built by Yodo gimi the mother of Hideyori.